later, the Society received an offer to establish itself in its first official headquarters. Bruce Wood Hall of the Hempstead Bank proposed that the Town of Oyster Bay take ownership of the Wightman House (then a shop on South Street) with the understanding that the Society maintain the 18th-century house for its operations. The next year, the Wightman House was transported to a Town-owned lot on Summit Street. Following a program of rehabilitation under Town direction, with the invaluable assistance of John M. Collins, the Wightman House officially opened its doors on November 25, 1972 as the Society headquarters, dedicated to public use and enjoyment. The first floor held meeting and reading rooms, exhibition space, a reference library, and a working kitchen. Early programs involved trips by local school groups, with a gift shop and guide booklet available for visitors. Society activity increased broadly with the hiring of Thomas Kuehhas, the first professional director of operations, in 1992. The Society re-interpreted the Wightman House’s two front rooms as a Colonial living space and a 19th-century minister’s parlor respectively, while the North Country Garden Club transformed the back grounds to an 18th-century garden. Educational and community programs were greatly expanded to include Revolutionary War encampments, old-time children’s and maritime fairs, antique and automobile shows, and preservation advocacy. 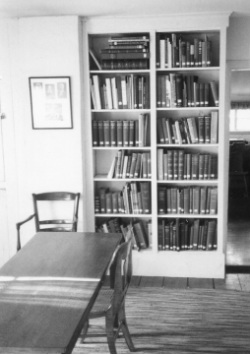 By the late 1990s, it became clear that the Society, its activities, and its collections were quickly outgrowing the confines of the Wightman House. Trustees launched a capital campaign and established a building fund in order to design, erect, and furnish a new research and collections center on the grounds behind the Wightman House and garden. With the support of the Dolan Family Foundation and many generous donors, this effort reached fruition more than a decade later with the opening of the Angela Koenig Research and Collections Center on February 12, 2011. The Koenig Center boasts an exhibition gallery, lecture and workshop facilities, library and archives, events kitchen, and staff offices. The Wightman House, meanwhile, has not been left behind. It still features its 18th and 19th century period rooms, along with a newly opened shop dedicated to local arts and crafts, and a soon-to-open permanent exhibition on the history of the house itself.